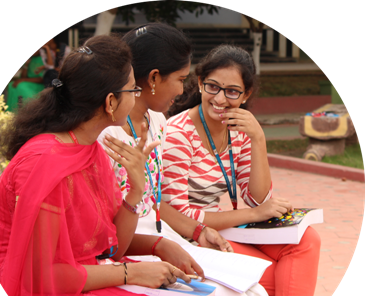 Welcomes applications for graduate B.Tech as well as Post graduate M.Tech & MBA admissions. Our VISION is to ignite the minds of the students through academic excellence so as to bring about social transformation and prosperity. The Campus, sprawling over 100 acres, is located in the verdant atmosphere of Vishnupur in Bhimavaram. Category A seats - 70% of the intake are under this category and these seats are filled by EAMCET Convenor. Category B seats - 30% of the intake in each course are made by the competent authority of the Government of A.P. through online admission process. NRI Candidates (sons and daughters of NRIs) 5% Eligibility: A pass in the qualifying examination with not less than 50% of marks in the prescribed group subjects or 50% aggregate marks in the qualifying examination or CGPA equivalent to 5 on a scale of 10. Additional 20% of intake are admitted to II year B.Tech. course under lateral entry scheme based on ECET rank. Students from Diploma and B.Sc. streams are eligible. Category A seats - 70% of the intake are under this category and these seats are filled by ICET Convenor. Category B seats - 30% of the intake in each course are filled by the the institution following the guidelines stipulated by the State Government.. The candidate should have passed the qualifying examination B.TECH/BE/POST GRADUATION. Students belonging to SC/ST with family income less than Rs.2.00 Lakhs per annum. Students belongingto BC/EBC-OC/Disabled/Muslim Minority with family income less than Rs.1.00 Lakh per annum. Candidates should submit the following relative documents (Xerox copies with attested by concern Head of the Department) to the scholarship department before stipulated date. Integrated Certificate (Prescribed format of COMMUNITY, NATIVITY & DATE OF BORTH CERTIFICATE, issued after 02-06-2014 by Tahsildar through Mee Seva by the students belongs to EBC/OC students only. Integrated Certificate (Prescribed format of COMMUNITY, NATIVITY & DATE OF BORTH CERTIFICATE, issued after 02-06-2014 by Tahsildar through Mee Seva by the students belongs to EBC-OC students only.